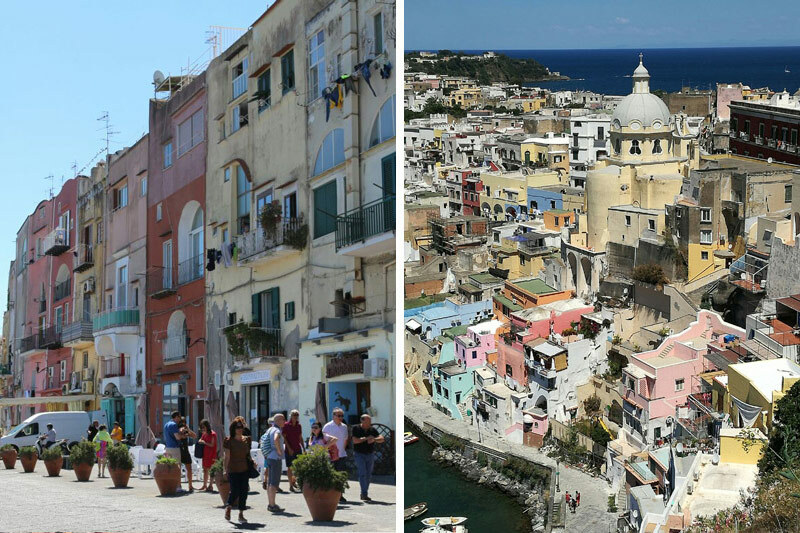 We asked one of our members, Paul Barber, to write an account of his journey to Procida. It is one of the Flegrean Islands off the coast of Naples created by the eruption of four volcanoes, now dormant and submerged. It is a location for films and an annual film festival. Procida is the smallest and least touristy of the three volcanic islands in the Bay of Naples. Mercifully (for some) off the mass-tourist radar, Procida is like a Portofino prototype and is refreshingly honest and real. Procida is loved by Italians, who flock there in August but is less visited than its tourist-hotspot neighbours Capri and Ischia. Procida is very heavily populated, with 10,000 residents squeezed into less than two square miles and has an authentic lived-in feel. The island doesn’t have many particular sights of interest so travellers should visit to experience the island’s picturesque, slightly shabby charm, beautiful scenery and wonderful seafood. 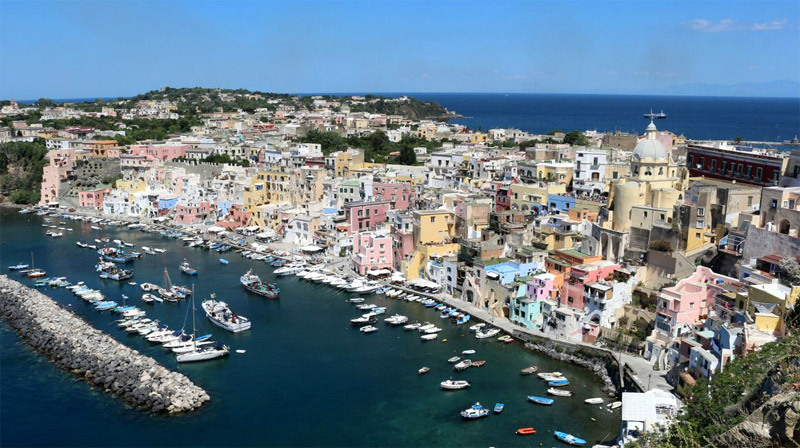 Procida’s charm has led to it featuring in a number of films including the classic ‘Il Postino’ and ‘The Talented Mr Ripley’. Procida has frequent ferry services from Naples, Pozzuoli and Ischia and is ideal to visit on a day-trip. My ferry left Naples at 9.25am, arriving on Procida an hour later, with my chosen return ferry departing at 4pm, arriving in Naples at 5pm. That allowed me to be back in Sorrento for my evening meal. Visitors disembarking from ferries arrive at the Porto. A road runs along the harbour-side passing the island’s principal church ‘Santa Maria della Pieta’. On the landward side of the street are shops, restaurants and bars, with the rest of the town built on the slopes behind. From the church a picturesque narrow lane climbs upwards to a junction where you turn left to the Terra Murata (“walled land”). Here is the highest and most defensive crag on the island; the site of the oldest settlement, a fortress, a monastery and – until recently – a prison. Ascending through two stone gateways you reach the Terra Murata. There are superb views from the road leading up to the walls, and from a panoramic terrace (belvedere) looking towards the Bay of Naples. Here you also clearly see the now defunct prison, falling into disrepair. Walking back down to the junction there is a flight of steps on the left which leads down to the very beautiful Marina Corricella. This is a thin sliver of waterfront backed by a “cliff” of colourful fishermen’s houses. 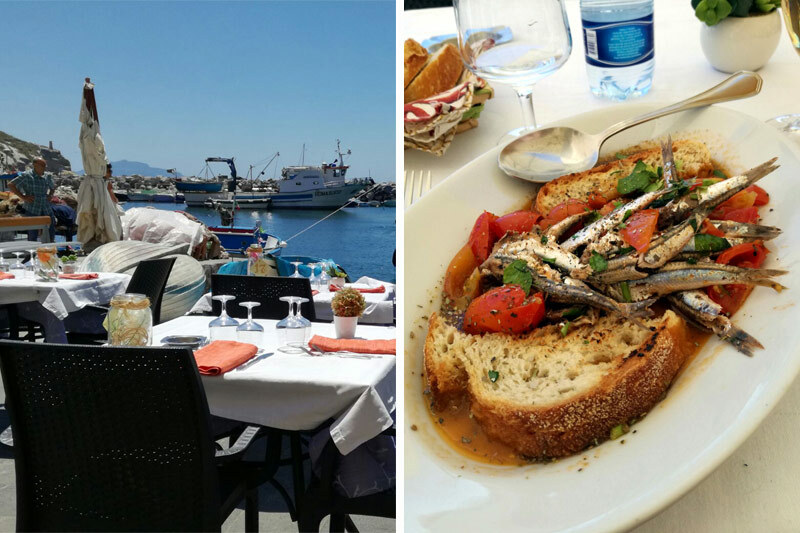 There are several bars and restaurants in Corricella, with tables attractively scattered along the waterfront, interspersed with painted fishing boats and nets. This is a wonderful spot to have a lazy lunch of seafood with the water lapping nearby, and is where much of ‘Il Postino’ was filmed. It is a bit of a walk from the Porto and you have to climb up the steps to leave the settlement, but it is well worth the effort. This short visit filled my time on the island and I saw most of the island’s places of interest. It is a vibrant, interesting place, and for the intrepid traveller who wants to see this authentic no-frills gem of an island well-worth the effort to visit. I found the ferry journey to Procida very good, even though I took the slow ferry rather than the jetfoil. There are plenty of sailings daily from both Naples and Pozzuoli (worth knowing that, because the ferry journey from Pozzuoli to Procida is very short indeed!). Visiting Procida requires people with a reasonable level of fitness, because it is hilly, and to get from the ferry landing to any of the sights can be quite tiring. After the glitz and glamour of Capri and the spas and gardens of Ischia, Procida offers visitors a unique charm and relaxed environment just a ferry ride from the tourist hot spots. There are ferries from Naples, Pozzuoli and Ischia (for island hoppers) so a day visit from Sorrento is feasible. Alternatively, you could enquire about private small group tours currently available with Friends of Sorrento. The copy and photographs of this page are subject to copyright.